...without public policy purpose, by so many, to so few." That's Professor Professor Ross Garnaut, on the Rudd government's decision to 'build on' the excellent ideas in his climate change review. He is referring to the government's decision to donate $3.9 billion in unconditional payments to electricity generators in relation to 'compensate' them for the emissions trading scheme. Garnaut is furious too at the Government's decision to issue free carbon permits to industries exposed to international competition, such as steel, chemicals and paper and pulp. He writes that this is an act of protectionism that threatened to provoke other countries to follow suit and likens the danger to the notorious US protectionism that deepened the Great Depression of the 1930s. And he says the Government shouldn't have limited Australia to a maximum emissions cut of 15 per cent by 2020. It should have kept 25 per cent "on the table". As he puts it: "Australia cannot play a strongly positive role in encouraging the global community towards the best possible outcomes if it has ruled out in advance its own participation in strong outcomes." That's how it's described in an exclusive story by Peter Hartcher on the front page of Saturday's SMH. 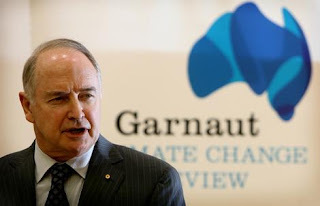 Garnaut's own words, damning of the decisions made by the man who trumpeted his appointment, are here and here and here.